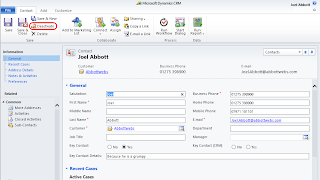 Ok, so i was transferring a bunch of records with lookup field linked to contacts and accounts from an old CRM 4 deployment to our new CRM 2011 deployment. I was trying to do this the quick and easy way……exporting records to excel. So, then i remembered that we had recently ran a duplicate contact clean-up job on our contact records using the de-dupe process to find the duplicates and merging the records together. So i searched for John Smith but this time i searched for both Inactive and Active records and voila! 2 records! So, first point, by doing this i discovered that the when resolving lookup references, the import process includes deactivated records and as far as i can see there is no way to turn this feature off. So, after being mad at MS for a while, i eventually realised that actually this wasn't a bad idea, especially when migrating historical data. However, my issue was, how do i get around it?! Wrote an OnDemand workflow that first of all, takes the values of the “First Name” and “Last Name” fields and populates them into the newly created fields above. The workflow will then clear the “First Name” and “Last Name” fields. This thus changes the full name to blank. Ran an advanced find to show all inactive contact records. Ran my workflow in step 2. Wrote another workflow that takes the values of the “Old First Name” and “Old Last Name” fields and populates them into the “First Name” and “Last Name” fields. The workflow will then clear the “Old First Name” and “Old Last Name” fields. This thus changes the full name back to what it should be. Ran my step 6 workflow. Hope this helps and if you have read to this point…..well done for sticking with it! BIG NEWS: Microsoft & Salesforce.com Annouce Partnership!!!!! 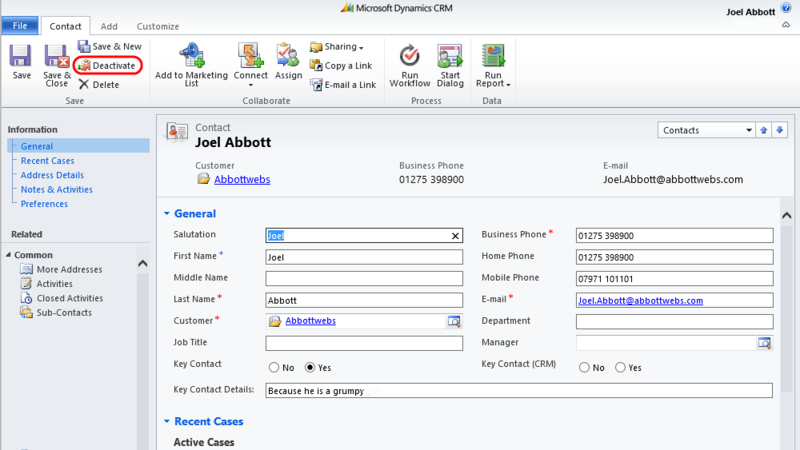 Having worked with Microsoft Dynamics CRM 4.0 in a sales & development environment, my focus now is on customising this awesome solution and showing its true potential.